Types of Art: The adone, sculptures depicting antelopes, are mostly shown at the ceremonies marking the end of the mourning for a 'land chief'. The wandering spirit of the deceased, his shadow, is captured by the adone, and is thus made temporarily into the seat of the altar. 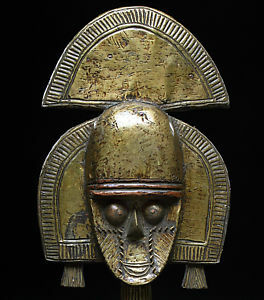 History: The tribe is said to have been chased from their native territory further to the north by the Dogon invaders. They migrated to the Yatenga district in the Lurum region, where they have settled since the sixteenth century. Political Systems: The Nioniosi, as the Kurumba people call themselves, are grouped into several clans: the Sawadougou, the Oueremi. the Zale, the Tao, and so on. Religion: The polychrome antelopes seem to be the property of the Sawadougou clan, and the sculptors and wearers of the adone are recruited exclusively from this family. This privelege reinforces the religous power of the Sawadougou, who are regarded as the direct descendants of the founder-ancestors of the Nioniosi society. Credit: The Dance, Art and Ritual of Africa, Michael Huet, pg. 102.